Timothy was called into the ministry by God and by Paul. In doing so, he was publicly ordained by the presbytery in the presence of “many witnesses.” At this time he confessed Christ before all, and made the conscious decision to endure physical agony too, meaning circumcision as a grown man. Knowing Timothy’s possible timid profile, this was no small step. What get’s me is the manner in which the Apostle exhorts Timothy in verses 13-14. What if some revered minister placed his hand upon my shoulder and said, “I charge you in the presence of God, who gives life to all things, and of Christ Jesus, who testified the good confession before Pontius Pilate, that you keep the commandment without stain or reproach until the appearing of our Lord Jesus Christ…” Talk about high expectations! But aren’t we all called in such a fashion, when you get right down to it? We just don’t take our role in defending and modeling the faith seriously enough! Simply, it’s up to Timothy—and me and you—to be stainless, so that message will be stainless, or as Vincent says, “unsullied.” This is no small task. It requires godly discipline of the highest order. This is the kind of guy Timothy was. He was capable, despite his alleged timidity and ill health, of the same kind of fortitude and courage of his mentor Paul. He had the right stuff. This entry was posted in Commentary, Devotionals, Principles, The Basics, The Timothy Project and tagged 1 Timothy 6:12-14, commandment, confession, witnesses. Bookmark the permalink. 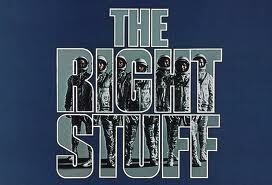 There are so many people that still have the “right stuff” and are living it out. The problem is that they are typically overseas or worse, here in our country and are deflated by the good ol’ American Christian traditions of either legalism or apathy. Either way, more of us need to take that step up. Our biggest failure is our unwillingness as Christians to be audibly authentic among the heathens. What ends up happening is if we take a stand no one knows why, or excuses are made like “got to drive home” or “you know us Baptists” instead of “no, would if I could, but setting an example.” I think Jesus was a lot more natural in his movements among the lost and he obviously talked about everything he was doing. I have to agree that Jesus responded to attacks much more naturally than what we tend to do. It seems we make it so complicated when we explain why we do something or don’t do something. Jesus would just throw out a simple scripture very matter-of-factly, whereas I probably tend to give a “Well, see, uh…” that some long explanation that I think is tailored to the person I’m talking to instead of just laying out the word of God and letting The Spirit work on the individual’s heart. I think what makes it hard is allowing silence in a conversation. Sometimes we just need to shut up after a brief explanation and watch God work on the heart. Proverbs talks about an apt answer. That’s what we need. I am too verbose or I say nothing at all! Thanks for the response.